Winter presents an opportunity to judge your landscape. Like a black and white photograph, the structure of the landscape becomes dominant after the flowers and leaves are gone. Weaknesses will show up and give you the opportunity to plan for improvements in the spring. What are we looking for? To begin with, view your home from the predominate view. That is the way that you direct new comers to your home. Go down the street and view your home as you approach your driveway. First look for balance; are the plants taller at the end of the house and shorter by the garage? Does the landscape direct your view to the entry or is the entry obscured? Do your plants highlight the windows or hide them? Many homes have special details in the architecture. Does your landscape accentuate the details or hide them? Some frequent mistakes. A common mistake is having shade trees that block the view of your home as you approach, or evergreen trees that cut the view in half or block details. Many people rely heavily upon deciduous shrubs to set the shape of the landscape, only to find that in the winter the shape disappears. In addition, flowers are often given more work than they can handle. An intricate flower planting is an added detail that will have little if any weight in the winter. So now what do we do? Now that you have critically looked at your landscape, do it again. This time take notes. 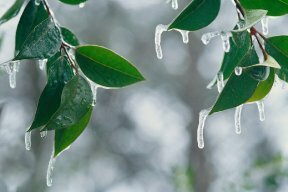 Look for the common problems, but don’t overlook the fact that even well planned landscapes can be improved by judging their winter presentation. Adding strength to the design may be as simple as changing a color or texture. In many cases, changing some of the deciduous shrubs to appropriate evergreens will greatly improve the design. When do you call a designer? Now that you have reviewed your winter landscape and have questions on how to get the look that you want, call your local garden center. January is a great month to talk to a designer about your analysis. They normally have additional time to spend with you in the winter to plan your improvements, and they look forward to your call! Great article! Not only timely but informative. I like to take photos of the yard from several vantage points and then enlarge the prints so I can draw on suggested changes in the comfort of our home. We are making plans to renovate 2 beds this spring. That is a great way to analyze your landscape! Thank you for the comment.